This is what I woke up to today. This was taken at 8.15am - just bizarre! I can't remember the last time I experienced a dust storm. 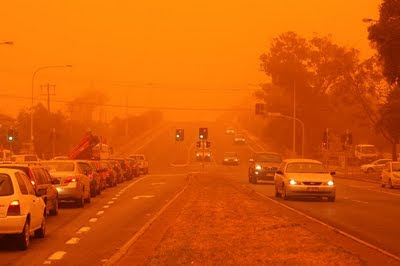 Living on the coast we don't often get these dust storms, they're usually more inland Australia. It was the weirdest orange and very windy. I hunkered down all day inside trying to stop the dust coming in the house. apparently the worse in 70 years - i wonder if anyone older enough would remember the last one?? All the lights that went a weird blue tint early in the morning, that was freaky too! I was too scared to take my camera outside!